A pride of lions is a family unit. The animals travel together, protect each other and share any prey. While there isn’t exactly any hunting going on in Fort Greene, the Bishop Loughlin M.H.S. Lions boys’ soccer program has adopted this same family mentality. 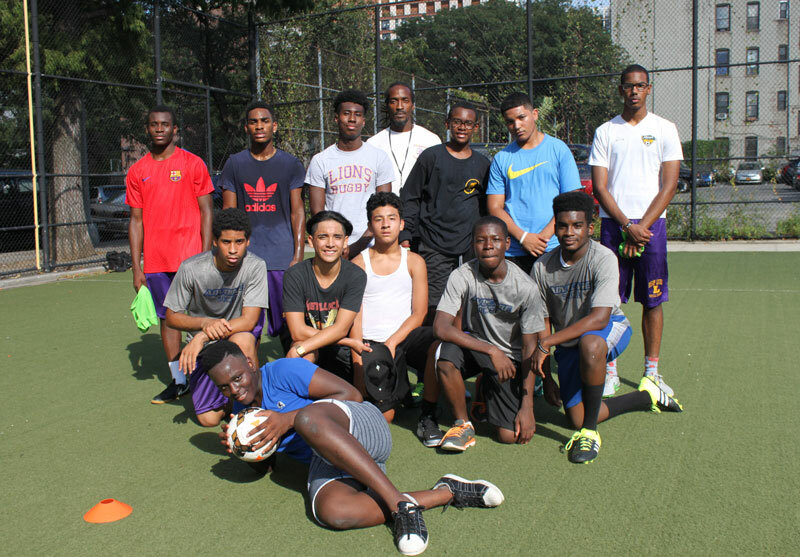 The Lions recently began their first season in the local CHSAA soccer league. The team played last year in a developmental league to prepare for this fall. It had been quite some time since Bishop Loughlin fielded a boys’ soccer team, and the program’s rebirth began last year under head coach Ranford Penny, who found out about the opening since his children attend the school. Penny played college soccer at St. John’s University, Jamaica, 1995-99. He later played for several semi-pro teams before beginning his coaching career. He spent 12 years as the head coach at Baruch College, Manhattan, before coaching for the Woodhaven Soccer Club. This extensive soccer background has benefitted the development of the young Lions players. Last year as the team was settling in, the Lions played to one draw and lost all their other matches while only scoring two goals the entire season. However, the positive mentality this year already has the team believing it can get better fast. Early on this season, the returning players from last year’s squad rose into a leadership role to help the new players adjust. Day by day, the team began to improve as it learned from last year’s mistakes. As the school year began, the Lions consistently fielded a team of about 12 players. A soccer team has 11 players on the field, so the team has made it a point to spread the word around the school to find other interested student-athletes. In addition to word of mouth, the Lions can make some noise throughout the school by playing their best. The team has the stamina and energy it takes to compete, so now it’s a matter of controlling the ball and creating scoring opportunities. The great thing about the rebirth of a soccer program is that it’s a marathon, not a sprint. There are bound to be some growing pains this season, but each teaching moment is another brick in the foundation of what is set to become a successful program. The Lions have adopted the notion of “family” as their team motto during this historic first season. Win, lose or draw, the players know that they are in this together, just like a pride of lions. So over the next few seasons, expect these Lions to roar!